RECOVERY - Keto Aminos™ combines essential amino acids to assist with repairing muscles, allowing for optimal muscle recovery as well as preserving muscles. WEIGHT LOSS - Thanks to MCTs and Beta-Hydroxybutrate (BHB) salts, your body goes from burning glucose (sugar) to burning fat as your source of fuel, all while delivering sustained energy for better workouts. 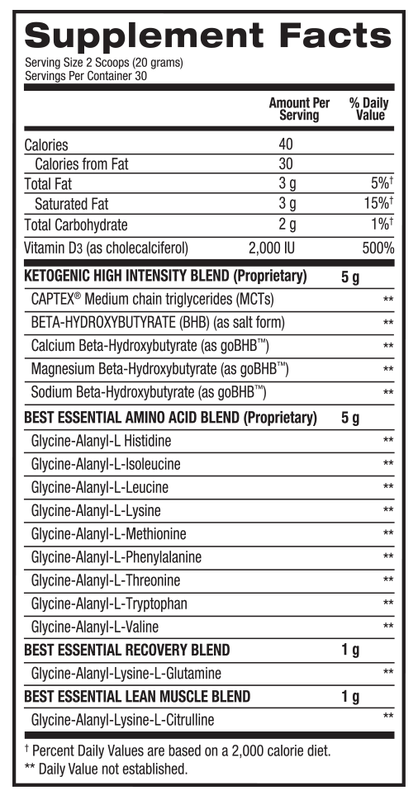 MUSCLE BUILDING - The essential amino acids in Keto Aminos™ promote lean muscle growth through increased protein synthesis, preventing muscle breakdown (catabolism). ENERGY & STAMINA - Keto Aminos™ features the same oligopeptide-enzymatic technology as BPI Sports’ BEST BCAA, helping to bind amino acids together, for easier transport into the muscle, optimizing absorption and maximizing benefits.